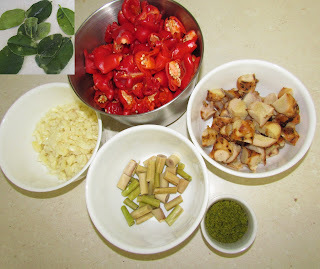 Bits out the Back: Hot stuff from the patch.. Sambal oelek & Chilli Paste.. Hot stuff from the patch.. Sambal oelek & Chilli Paste..
We have been very lucky so far this year in that we have had no **crosses every digit * fruit fly strike any of the chillies in the patch.. The bell chillies near the house were my big concern as they have no protection unlike the the large chilli in the hoop house..
A few weeks ago I decided to use up the collected chillies in a chilli paste so went searching on the interwebs for some inspiration.. An online friend (Tar Joy) pointed me in the direction of one she had tried & liked.. It looked promising but we were missing a few ingredients so I decided to make up my own using the recipe as a rough guide..
Add all ingredients, except for the sugar & vinegar, to the food processor & chop on high for about 30 seconds. Slowly pour the vinegar in while the processor is on high until a smooth paste has formed. Move the paste to a saucepan & bring to the boil. Slowly add the sugar & stirred through until dissolved. This batch filled 3 sterilised 500ml jars.. 2 of these were added to a hot water bath for 10 or so minutes so they could be stored for later use with one being gifted to some friends..
We have been very pleased with the fresh citrus flavour off this paste.. We have used it to spice up some leftover roast pork & also to make an AWESOME coconut prawn curry.. Can't wait to experiment with the next batch we make up..
Nice & easy Chilli paste..
A simple no frills recipe to make up this basic yet versatile paste.. Thanks to Granny Mel for a few pointers on the paste.. Process chillies on high for 30 seconds or until finely chopped. Add to saucepan with water & salt then bring to the boil. Reduce to a high simmer for 4-5 minutes. Turn hotplate off & allow past to cool for 5 minutes. Stir Vodka through paste then add to sterilised jar & seal. I would recommend storing it in the fridge. This is such a basic recipe that only takes 15 minutes to whip up & can be used in so many different styles of cooking..
Shall post the other chilli paste recipes later if I think they are tasty enough..